Version 2.1.1 has been sent to the App Store to fix an issue in a low memory situation, stay tuned and reboot your iPad if you have trouble processing many tracks (around 10,000). The maritime world is a fascinating world. The amount of ships that sail the seas is incredible, and the number of people involved or enthusiastic about sailing is beyond imagination. Stevedores, pilots, VTS operators, mariners, lock controllers, boatmen, cargo handlers, operators, mariners and fans alike: would it not it be great to know, what ships are out there? Well now you can. 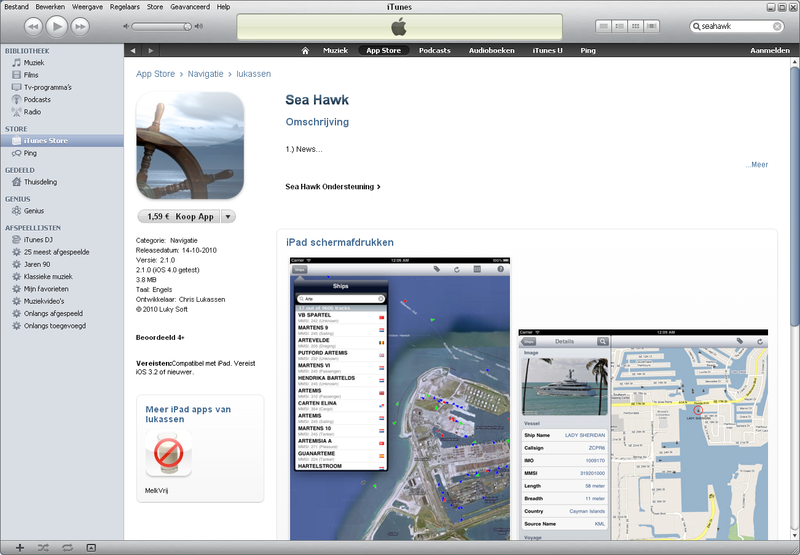 SeaHawk is great app which can show you the maritime traffic overlaid on a Google map. The traffic can be refreshed automatically (live feeds) or manually (refresh button). Labels can be toggled to avoid cluttering the display. It also includes a list of vessels that have been detected by the application. This list can be searched and can be used to find a certain vessel by filtering on the name, call sign, IMO or MMSI number. SeaHawk uses different colors to distinguish between different types of ship which allows for easy discrimination between the ships. Green Local vessels such as: fishing, towing, dredging, sailing, and pleasure craft. Yellow Port related vessels such as high speed carriers and pilot vessels. Purple Search and Rescue vessels. White Authority vessels such as police, military, medical, anti pollution etc. Dark gray Identified ships of other types. Gray Unidentified ships or ships of unknown type. The Inter VTS Exchange Format is an IALA Recommendation for the exchange of VTS (Vessel Traffic Service) data by the competent authority. This type of feed is available in all major Dutch sea ports, as well as in Hong Kong, Shanghai, Lobito, Tallinn and Singapore. To use this data you will need permission from the port authority and a valid user account. (Typically this means you are a stakeholder in the port). SeaHawk can receive IVEF over HTTP GET or PUT and also streamed over TCP/IP (port 8043) for real-time updates. SeaHawk is under constant development, send us your ideas, problems and suggestions. We are looking forward to them. Dit programma werkt niet! Ik heb geen belangstelling voor de scheepsverkeer bi Shanhai! Ik kan nergens naar een ander server gaan, bij edit zou het moeten, maar gaat dus niet! You are actually the first to provide this feedback, so I am grateful for it. I’ve put together a little movie that shows how a feed can be added, and added all feeds known to me as built-in in the new version. You can expect it to hit the App store in about 8 days. The application doesnt work, it collapses all the time. Thanks for the feedback and the testing you did. We found this can happen in a low-memory situation, rebooting your iPad will help, as will running a memory manager like Memory Pro. Thanks again for your report and sorry for the inconvenience. This version also no longer crashes on a low memory situation but provides the user with a warning. 3 more feeds have been identified and are incorporated in the new version. It will take some code change to incorporate them, but stay tuned for the next update! How do I configure tcp/ip stream, i.e. Address port? There’s a couple of formats, so it depends a bit on what you pick. KML over HTTP allows you to specify an URL so you can say http://myserver.com:1234/mydata.kml (or kmz) which implies port 1234. All IVEF servers I know run at port 8043, as for AIS. I had to look that up, but there is currently no way to specify the port. It also assumes the AIS data is running at port 8043. You only need to add the server by ip or domain name.